We have been very lucky this winter as far as sickness goes, knock on wood. Last winter brought on cold after cold, flu,strep throat, ear infections and pneumonia for our household. And it is so hard to see you little child sick and not be able to tell you what hurts and for you to explain to them how to feel better or make them eat. I was SUPER impressed with the Dr. Hippo series I received from Dr. Charlotte Cowan, MD. These 32 page hardcover books tell stories about different animals with different ailments. There are 5 in the series. The Moose with the Loose Poops, Peeper had a Fever, Katie caught a cold, The little Elephant with the big earache and Sadie’s sore throat. (Guess which one was Sadie’s favourite?) Sadie sat through every one. They were just the right length for her and the full color pictures were amazing. Each book also comes with a separate laminated Parent Guide with Questions and Answers one may have. 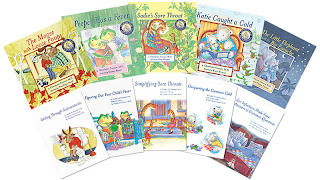 These books will help you explain to your child why they feel the way they do and how to help them get better and feel more comfortable doing it. Visit www.drhippo.com and learn more about the Dr. Hippo series of books. A must have for your child’s’ library. They can also be bought on Amazon.